Standard door strike with adjustable tab. Replaces most residential interior and exterior strikes. Fits all standard doorways. Includes 1 strike and 2 installation screws. Standard door strike with adjustable tab. Replaces most residential interior and exterior strikes. Fits all standard doorways. Includes 1 strike and 2 installation screws. Standard latch strike with 1-5/8" hole centers. Adjustable tab. Replaces most residential interior and exterior strikes. 1-7/16" x 2-1/4". Standard T-strike, used on wood or metal jambs with most grade 2 locksets. Includes 1 strike with (2) #8 x 1" Phillips flat head combination screws. 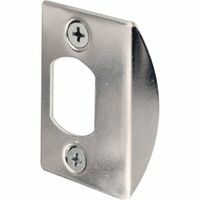 Prime-Line Latch Strike, Standard, Suitable For Use With: Standard Residential Doorways, 2-1/4 in Length X 1-3/4 in Width, Steel, Chrome Plated, For Residential Interior and Exterior Strikes Standard latch strike with 1-5/8" hole centers. Adjustable tab. Replaces most residential interior and exterior strikes. 1-7/16" x 2-1/4". Standard latch strike with 1-5/8" hole centers. Adjustable tab. Replaces most residential interior and exterior strikes. 1-7/16" x 2-1/4". Standard latch strike with 1-5/8" hole centers. Adjustable tab. Replaces most residential interior and exterior strikes. 1-7/16" x 2-1/4". Replaces standard strikes and provides improved security with 3" screws attaching to wall stud. Overall size: 4-1/4"H x 1-1/8"W. Includes 1 strike with (2) #8 Phillips flat head screws and (2) #8 x 3" Phillips drywall screws. Commercial door strike. Fits standard ASA cutout. 4-7/8" x 1-1/4". Includes 1 strike and 1 set of installation screws. 1-1/4"W x 3-5/8"L high security deadbolt strike. Includes 1 strike, two 1" screws and two 3" long security screws to anchor into the door frame stud. Adjustability provides snug fit of door to jamb, stops rattle, assures engagement of deadlatch function. May be used on residential or commercial frames. Used on Roberts redi-frame and Timely metal frames. Overall size: 2-3/4"H x 1-1/4"W. Includes 2-piece strike with (2) #8 x 3/8" Phillips flat head machine screws and (2) #8 x 1" Phillips flat head screws. Covers marred doors and allow conversion of 2-3/8" to 2-3/4" backset or 2-3/4" to 2-3/8". Inside diameter 2-1/8", outside diameter 3-1/2". Includes 2 plated covers. Commercial door strike. Adjustable up to 3/8". Fits standard ASA cutout. 4-7/8" x 1-1/4". Includes 1 strike and 1 set of installation screws. Standard commercial 4-7/8" strike. Used on wood or metal jambs with most grade 1 locksets. Fits standard ASA cutout. Includes 1 strike with (2) #12-24 x 1" Phillips flat head combination screws. Strengthens or repairs wood jambs, improves security with 3" long screws attaching to wall stud. Includes 1 strike with (2) #8 x 1" Phillips flat head screws and (4) #8 x 3" Phillips drywall screws. 1/8" thick heavy gauge steel base allows 3" screws to anchor to wall stud. Finished cover matches common exterior trim. 1/8" thick heavy gauge steel base allows 3" screws to anchor to wall stud. Finished cover matches common exterior trim. 1/8" thick heavy gauge steel base allows 3" screws to anchor to wall stud. Finished cover matches common exterior trim. Supplied with 3" long wood screws to allow additional security by fastening thru jamb into 2 x 4 outer door framing. Replaces standard strikes and provides improved security. Plated steel strike is supplied with 3" long wood screws to allow additional security, by fastening thru jamb into 2 x 4 outer door framing. 1-5/8" W x 11"H. Spacing between deadbolt opening and latch opening: 3-5/8". Plated steel strike is supplied with 3" long wood screws to allow additional security, by fastening thru jamb into 2 x 4 outer door framing. 1-5/8" W x 11"H. Spacing between deadbolt opening and latch opening: 3-5/8". Plated steel strike is supplied with 3" long wood screws to allow additional security, by fastening thru jamb into 2 x 4 outer door framing. 1-5/8" W x 11"H. Spacing between deadbolt opening and latch opening: 3-5/8".